Available ONLY to Republic of Ireland destinations. 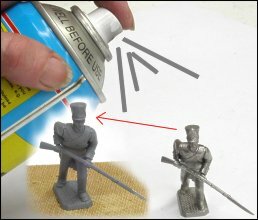 Priming your metal figure is essential before you start painting. Primer is like the glue that holds normal acrylic paint to the metal surface, otherwise the paint will flake. Shake the can for a few minutes. Stick multiple figures on a wooden board spaced evenly with a tiny drop of woodglue and carry it outside to allow proper ventilation. Spray from at least 10 inches away from the figure in broad strokes to avoid paint clotting on figure or running down the figure like tears. Turn the board 90% and spray figures from this new angle. Do this until you have sprayed from all angles. Archive | M145 LOTR 'The mouth of Sauron™' Metal Miniature.